There is something exquisitely beautiful about a well designed cottage garden. Learn the art and craft of good design so you can include cottage gardens amongst your offerings. Find out what a proper cottage garden is, and how to apply the principles of this concept to garden design and garden renovation. Explore the diverse range of both plants and hard landscape materials that can be used in a cottage garden. Be guided by our team of experienced garden designers and plants specialists, qualified and experienced in all aspects of landscaping and horticulture, who make up our horticulture faculty. Commence studies any time of the year, working at your own pace and from wherever it best suits you to study (even while traveling if you so choose). Mary Davis, in her 1993 book "Creating Cottage Gardens", says: "It is best described as a profusion of flowers, particularly perennials, closely planted for a very soft effect. A cottage garden will usually include such delights as lavenders, daisies and old fashioned roses. It's style is informal, a medley of soft shapes and harmonious colours..... "
Develop a check list of pre-planning information required for a proposed cottage garden on a specific site. WHAT TO PLANT IN A COTTAGE GARDEN? Traditionally cottage gardens were a random mixture of useful and ornamental plants, with more emphasis being given to the useful plants which for instance; could be eaten, used for medicinal purposes, or as animal forage. The ornamental plants were an afterthought, using colourful and easily grown annuals, herbaceous perennials and small shrubs to brighten the garden, space permitting. These days the best cottage gardens are carefully designed to give a pleasing arrangement of ornamental plants, herbs, vegetables, garden ornaments and accessories. Cottage plants are generally chosen with more forethought, although colour and abundance are still the most important features. Anyone can throw down a handful of seeds and within a few weeks have a wildly profuse and colourful bed of poppies, hollyhocks, nasturtiums and the like, but it takes rather more planning to create a cottage garden that looks charming throughout the year. 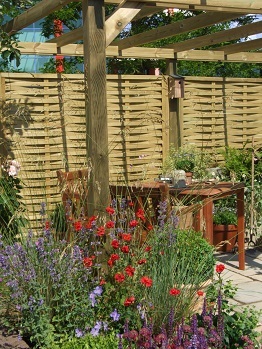 Dense plantings - using fast-growing annuals and herbaceous perennials will help to create the effect quicker. Self-seeding plants – these are used to perpetuate the effect. Use plants such as Myosotis (Forget-me-nots), Escholtzia californica (Californian poppies), Lobularia maritima (alyssum), Lychnis coronaria (rose campion), Tropaeolum majus (nasturtium) and Viola betonicifolia. Scented plants – bring fragrance into a garden and stimulate the senses. Contrasting foliage plants – provides an avenue to produce focal points and places of interest. Lawns are kept to a minimum – this allows maximum use of flowering plants and garden ornaments. Climbers – these are used to screen sheds, fences, other bad views, etc. The front garden is designed to showcase the plants right to the street. Within these broad guidelines, gardening styles vary greatly. Some cottage gardeners like neatly mulched beds with colour co-ordinated plantings; others like their garden to be functional, growing herbs and vegetables among the ornamental plants; and yet others prefer the romantic, slightly unkempt look, which is easily attained with cottage plants.